In the beginning there was great scepticism towards the thesis that Bach’s sacred vocal works were originally written for solo voices. Now this interpretation is firmly established. 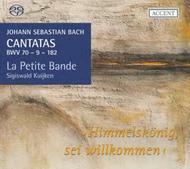 With this edition of one cantata for each Sunday and the great feasts of the ecclesiastical year, Sigiswald Kuijken and La Petite Bande strengthen this 'new' approach in their excellent performances. Vol.18 offers three cantatas - one for the twenty-sixth Sunday after Trinity, one for the sixth Sunday after Trinity and one for Palmarum. This volume of the complete edition brings the cycle, which began in 2005, to a close.